Life with Giggles: Proof of an annoying habit! Remember when I posted about one of the annoying habits that had to do with the Mr.'s slippers? You can refresh your memory by reading it again here. 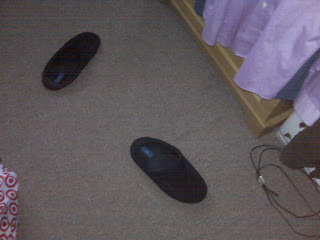 Well, this morning when I woke up, the first thing I saw in the middle of the floor... the slippers! So, I decided to take a picture as proof!